Information can only become a business asset if it’s not hampered by delays, bottlenecks or confusion. Ricoh’s innovative Streamline NX has been specifically designed to transform the flow of information, improve document workflow, and boost productivity across the organisation. It recovers wasted time; increases productivity through the intelligent use and management of resources; and enables your organisation’s capital investment to yield more value over time. Streamline NX will transform your business and positively impact your bottom line. Scan and Fax Manager: documents can be scanned from any Multi-Functional Product (MFP) then faxed, emailed or stored. By automating processes and reducing reliance on hard copies, productivity is boosted and the risk of human error greatly reduced. Secure Print Manager: print jobs are stored on a server and can only be collected by the person (or a designated other) who sent them to print. They can pick it up on any networked device within the organisation, whether it’s on-premises or another company site, even if it’s in a different country. Authentications and Accounting Manager: an integrated identification system can restrict access to MFP functions. It enables IT administrators to define user access to different printing functions, folders and workflows. This enhances security and reduces instances of documents being uploaded to the wrong workflows. Streamline NX can also use companies’ pre-existing ID cards and database infrastructure. Report Generator: provides organisations with much greater visibility of what is being printed, by whom, how much they’re printing and which devices they’re using. These reports can then be used to identify further efficiencies and make cost savings across the business. Administration Manager: enables total control of all MFPs and printers from a single interface. IT administrators can monitor and audit devices, batch configure them, and install upgrades simply and quickly. They can also set and implement central policies irrespective of device location – whether on-premises or across worldwide sites. 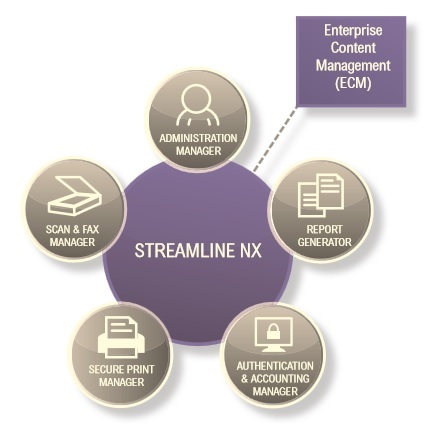 Streamline NX becomes even more powerful when it is integrated with existing, or new, Enterprise Content Management (ECM) solutions. This not only works seamlessly to achieve end-to-end efficiency and visibility gains across the lifecycle of documents, but also maximises your organisation’s return on existing investments. Streamline NX was designed to transform the way all organisations manage their document workflows. It enhances productivity, efficiency and security, and helps to decrease wasted time, effort and costs. It’s estimated that 6% of an average company’s revenue is spent processing documents. At the same time as much as 20% of the working week is spent searching for, or recreating documents, making the benefits of an improved document workflow obvious. Streamline NX turns ‘dead’ time into productive time; automating certain processes and inputting scanned documents directly into electronic workflows. It reduces the time workers spend managing and accurately storing those documents and ensures they can always be found in one central location. Users have a much simpler experience as all MFP functions are accessible from one interface. Your fleet management will also become more efficient, as it enables your organisation to identify where its devices need to be located or what usage policies need to be set. Streamline NX helps companies reduce their costs as rules can be set, and policies enforced, to ensure that print volumes are reduced without impacting the business’ needs. These rules can include black & white, duplex printing and print quotas. Users can also cancel jobs on their individual print queue at the device, whilst uncollected documents sent to print can be automatically deleted. By automating processes, Streamline NX allows your organisation’s document workflow to contribute to reducing operating expenditure and making existing capital investments more productive. Right now, less than half of European leaders are able to confirm that they have a policy to control the printing of customer information. Streamline NX tackles this by requiring prints to be confirmed, so there is no chance of documents being picked up by the wrong person. It also ensures scanned documents are always sent to the right folders or workflows; and only authorised personnel can access them. And as every interaction is recorded, businesses have an audit trail making it easier to achieve compliance. Streamline NX gives businesses much greater understanding of their device usage. The reports it generates can be used to make informed decisions regarding print policies and fleet management. Streamline NX’s ability to make document management more efficient will mean businesses become less reliant on hard copy documents, and wastage is considerably reduced. This, in turn, results in more sustainable practices without any impact on how your organisation works. Ricoh’s heritage is built on how documents and information are used by organisations, and how people in different sectors approach their document needs. Working closely together, our hardware and software engineers took on board that knowledge and understanding when designing Streamline NX. The solution they created directly meets customers’ needs for efficient and accurate document workflows. But, of course, any solution is only effective if it meets your business’ unique requirements. That’s why we always work closely with our customers to ensure they have the best workflows and policies to match their requirements. Streamline NX is, simply, the most comprehensive solution for managing your documents and improving workflow productivity. It delivers now and into the future. All you need to do, is contact us.